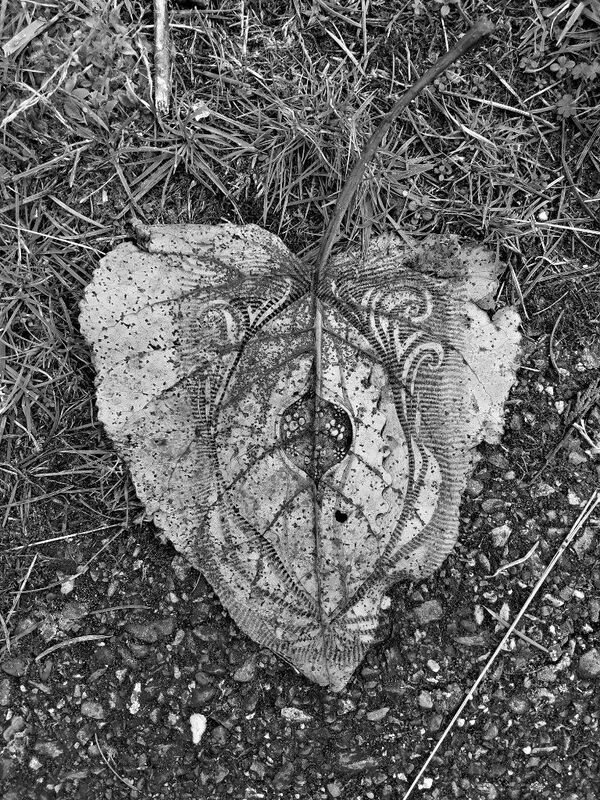 The leaf reminded me of an old piece of parchment. Trying to read the parchment I couldn't figure out exactly what the meaning was. Perhaps that something new was about to be born. Dog-oh seemed to be relatively disinterested. He had smelled leaves before and other things were more enticing. Thanks for reading! The picture was originally taken by me with my Galaxy S7 and processed in GIMP and is a collaboration with @kalemandra who so nicely provided some cool artwork. How wonderfully artistic of you. It really deserves a closer look. Kalemandra's art is very inspirational and she is a delight to work with. Thank you! I like how the details in the pencil artwork show in the photo when you look closely. This is fantastic and very creative! :))) Thanks for participating! Thank you! I really enjoy working on these types of things, and often I kind of need something to get me started doing things and it helps to have something really neat like your art for inspiration. Thank you very much for the comment, vote, and resteem! You can't beat GIMP for price to value ratio, LOL. I'm gradually learning more about it but still have all the Photoshop quick keys memorized that I try to use on GIMP. I am trying to get a better handle on Photoshop. I watch a tutorial and think I know something until a day goes by and I try to do something again and have to go back to the tutorial...frustrating... Getting old I guess! That's how it goes with me too. I just get used to something and then have to learn something new. Oh well, it keeps things fun. I like Photoshop too but my copy is so old that it runs on XP and I'm a bit frightened of booting into that operating system at this point, LOL. I tend to use GIMP more because of that. Thank you. I enjoy these collaborations, I'm glad you liked it. its ok you visit my blog i hope you like my post?? thank you so much brother @lightsplasher i will be 100% support from you go ahead and carry on??? 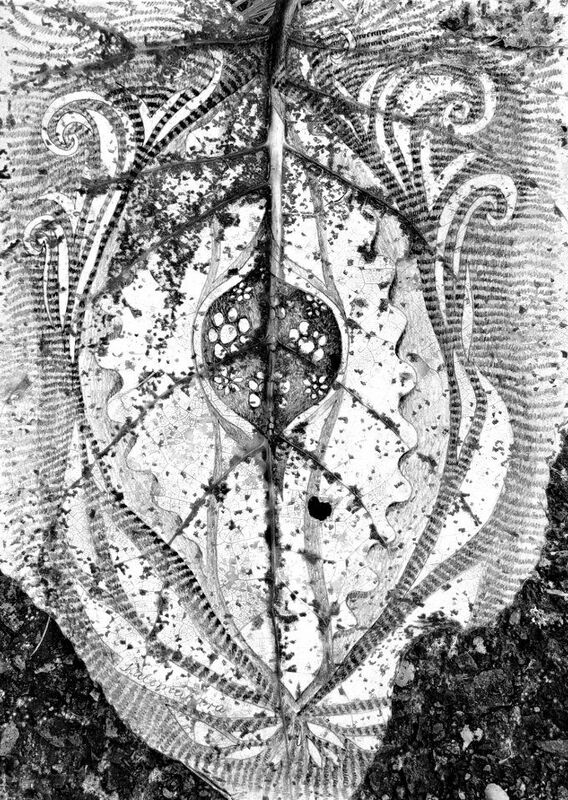 Wow- when @Kalemandra's art is combined with the leaf - it sort of looks like a guitar! Awesome! Thanks! It does look like that now that you mention it. Pretty cool! Thank you! Some of the old black and white photography used interesting effects as well both in the exposure and development of the prints. I think we kind of got out of a lot of the special effects with color processing because no one could do it themselves. With digital processing there is many more opportunities to be creative both in color and black and white. It makes things fun. ohh,that's the reason, but it's looking so outstanding extraordinary photography, thank you so much. looks more beautiful in this mode.. Thanks! I kind of got into the black and white mode from the previous challenge. It is fun how things build on each other. Thanks! It is interesting how things come together through these collaborations. Thanks! I had fun making it. Thanks, I'm glad you viewed and liked it. Wow! This is awesome and you used the doodle so creatively.I am so tempted to participate in this challenge too. Thinking of something creative. You raised the bar high dude. Thank you! You should participate if your interested - it is really fun. This actually started out as my trying to do a collaboration with @everlove 's photo but things were not working out really well so I didn't post that. It is tough to see what is possible to do unless you try out a few things. Yeah I'm thinking of chipping in too though I don't know what I'll be doing. It is tough to see what is possible to do unless you try out a few things. Yes, what you said above, I completely agree with. A wonderful piece of art, delicate and fragile. Really inspiring! Thank you! The leaf was very fragile looking, I'm surprised it was mostly still together after the light snow, rain and frost. Thank you! It would be interesting to see what it looked like printed out. You're lucky to find it :) it looks beautiful! Thanks! I feel lucky when things come together and form something different or unusual. The intricacies are captivating! I'm willing to bet that Dog-oh already understood the message. ;) And yes, the nose is the all-important guide to adventure. My Scotties used to say that that is because they know where the treats are. Exactly! It is just amazing the level of excitement that Dog-oh has when I even make the littlest motions towards going for a walk. I believe he knows what I want to do before I do. (Or hopes so). Well they seem to know what is best for us before we do! ;) Some of my best teachers have had four legs! It is beautiful how nature so Inspires and opens simply by being. Love the art work too, I see Yoni, so very apt for New Birth! Gorgeous! I wish I had a notebook pad of these beauties! Thank You! Wonderful photography, its looking really beautiful, thanks for sharing. This is an awesome photography. Its really amazing photo and also creative art. I really impressed your photography. thanks for the new blog. that is great and nice photography. wonderfull post i like it. inspiration is a great factor to attain success.